Josh Ng of Twins Kitchen discovers the hottest spots to add to your eating agenda. Before you start a full day of dining, consider checking out the must-go archaeological site in this historic city. The Mayan Ruins in Quintana Roo are built on cliffs facing the rising sun, and El Castillo is the tallest structure located on the peninsula overlooking the beautiful beach and the Caribbean Sea. La Zebra Hotel is the smart traveller's boutique hotel of choice, and one that offers the very definition of a ‘beach chic’ experience in Tulum. Enjoy your post-hike morning sunbathing on the most beautiful beach with a chilled drink, or return in the evening for a phenomenal dining experience. Definitely try out their Fish Al Pastor taco, which pairs deep fried local fish fillets with black beans, sautéed onion and bell peppers—truly one of the best fish tacos I’ve ever had. Also try out their massive selection of mezcals—Sacrvm Madrecuixe and Bruxo Pechuga are my recommended choices. If mezcal is too strong for you, then opt for their Mezcal Mule cocktail. After your morning beach session, take a stroll to the nearby Frutas y Verduras Pool on the crossroad of Satélite Sur and Andromeda Ote to stock up on a wide range of exotic Mexican fruits, from guanabana (soursop) to mamey sapote, a tropical tree fruit. We love digging into the sweet, locally grown pineapples, and the Mexicola avocados—this particular breed has an edible skin and plum-like texture. Hartwood is one of the most well-known restaurants in Tulum, opened by veteran chef Eric Werner. Hidden inside the jungle across from Tulum beach, the journey to its front doors is a large part of why people come here. The daily menu features plenty of locally sourced produce, along with wood-fired meat and seafood, all served in a relaxed, open-roof setting. This immensely popular local seafood joint keeps busy by selling the freshest fish and seafood ceviches. The marinated seafood options include shrimp, fish, octopus and snails, and are available in three sizes. Try the mixed ceviches that are marinated with lime juice, seafood broth, tomato, onion and cilantro. I also recommend having their tortilla chips with a meaty seafood dip, as well as the marinated guajillo octopus tacos. Tulum has the most beautiful cenotes on earth, which are naturally occurring sinkholes caused by the collapse of the surrounding limestone. It exposes groundwater and creates a natural pool that is perfect for swimming and snorkeling. It makes the perfect place to spend your afternoon before another round of tacos. The natural beauty and refreshing vibe of these natural wonders are unparalleled. The Al Pastor is the most signature taco in Central Mexico, which consists of spit-roasted marinated pork, and local joint Antojitos La Chiapaneca is definitely the place to sate your craving. Apart from the al pastor, highlights include tacos pastor, tacos asada or tostadas , all at outstandingly affordable prices. 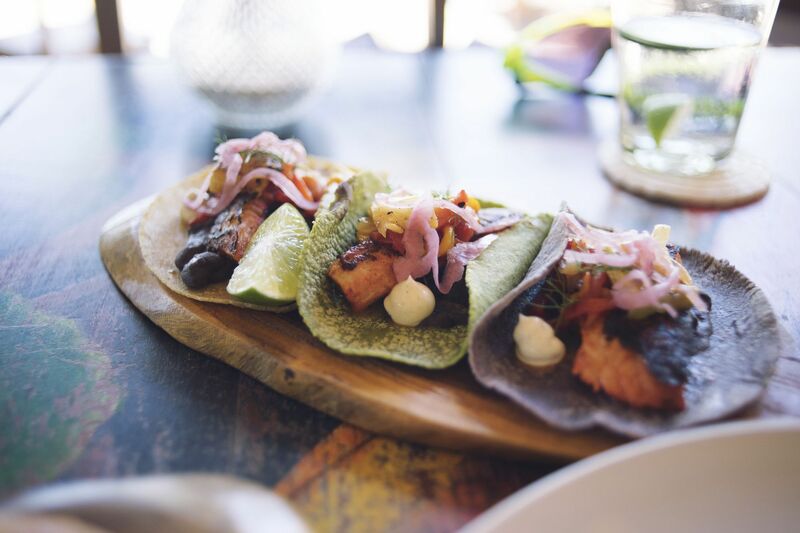 To experience more of Tulum, it’s best to have a meal in Arca, a modern farm-to-table restaurant set in the Mayan jungle. Their menu pays homage to the Yucatan Peninsula using the very best products from local beaches, farms, and the chefs’ own vegetable nursery. Apart from the seasonal food menu— try the prawn crudo and the wood fire grilled octopus—they also have an exotic cocktail selection that you simply cannot miss. After dinner, head for the city’s best gelato at Campanella Cremerie. Part café, part gelateria, here you can indulge in gelati and sorbets in local flavors such as dulce de leche, pineapple-basil, and yogurt with strawberries. For something more extravagant, there is also a list of composed ice cream bowls and waffles decorated with fruit and coconut. It is all about the mojito and mezcal in Tulum, and El Batey is the place to have both. Their mojitos are frequently crowned the best in town, and features fresh sugar cane juice crushed in the back of a converted VW Beetle. There’s great live music most days of the week, too.